Get supplies... something to eat and drink! this is a biggie! Firstly, I took a textured Grungeboard Tag and gave it a covering of Adirondak 'Snow Cap' Acrylic Paint Dabber. 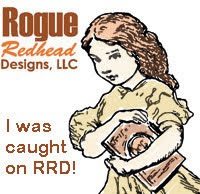 I sanded the edges and added a partial coating of Fired Brick Distress Stain and then stamped text using a stunning Rogue Redhead Designs Stamp (Relish Reading) twice. First in Snowcap Paint Dabber and then in London Fog Memento Ink to create a layered effect. Although I am relatively new to using them, I can honestly say that RRD stamps are of amazing quality and quite simply a joy to use. I toned the effect of the white down a little using Spun Sugar Distress Ink. Then, I inked the sanded down edges of the tag with Aged Mahogany Distress Stain. I covered a Tim Holtz Die Cut Heart with Fired Brick Distress Ink, dried this with a heat gun and then gave it a very liberal coating of Fired Brick Distress Stickles. Once this was dry, I sanded the edges and applied Aged Mahogany Distress Stain to the edges and a little more was applied to the heart itself. My Grunge Board Cherub was created using my own nail varnish crackle technique. Firstly, I coated it in Snowcap Paint Dabber. Once this was dry, I applied a coating of clear nail polish and again left to dry. Then, I gave it a liberal coating of Crackle Glaze Nail Polish and had lunch while I waited for it to dry! I covered the Cherub's Bow and Arrow in Platinum Stickles. This turned out quite bright, so I rubbed Aged Mahogany Distress Stain carefully across the Bow and Arrow to age them a little. I absolutely love using this technique... It really does make watching paint dry fun! I cut out Tim Holtz letters from the Seasonal Stack, distressed and inked the edges with Fired Brick and Aged Mahogany Paint Dabbers and coated with Fired Brick Distress Stickles. I die cut a border from Coredinations Whitewash Card and sanded it down lightly using a Basic Grey file. This was stuck down around the outside and lower edges only (so I could tuck the letters in slightly). I added a band of tissue tape to the upper part of the tag and stuck down the different elements. The yummy jewelled embellishment thingy has been cut from an old pair of jeans bought for a song from a carboot sale at the weekend. It was the fastening at the top of the zipper! I sanded it down and aged it a little and added a large Flatback Pearl to the middle. I am so proud of that little find! Ribbon finished off the tag - done! At the same carboot sale, I also found something very very special! I am afraid I do not know its original significance (yet!) but immediately, it had a profound meaning for me and really made me happy. One of the very best things about blogging for me has been making friends with 2 people that I am in touch with really regularly - Anita and Sue (there is a link to both of their sites near the beginning of this post) They are both really special. So... finding an old Pin Badge with the flags of both of our countries linked together was brilliant and I knew straight away what I could use it for. There's a whole lotta baking going on! There's a whole lotta baking going on in our house today! Though I have no 'Sweetheart' to make a card for, I made a Valentines Thank you card to the Queen of my Heart... my lovely daughter. I am always proud of my shy and artistic 14 year old daughter and today seemed like a good day to show it... by making her a card. I tried to get a lot of texture in this one, the big heart is recycled card from packaging, the wrapping paper covering is recycled Cath Kidston, stuck down and sanded and then smooshed with a mix of Mint Liquid Pearls and Crystal Stickles The greeting was embossed and cut out from a Cuttlebug embossing folder (Woo Hoo Anita!) All topped off with lashings of Glossy Accents and a decorated Prima Flower. She has already made a gorgeous batch of Sausage Rolls and is just putting the first batch of Peanut Butter Cookies into the oven. The Hummingbird Bakery cookbook is certainly MY favourite of her Christmas presents... beating the Derwent Watercolour Pencils simply because she keeps making beautiful things, which we both get to eat! Last week she made the most delicate 'Lavender Cupcakes'... loving all this baking! This ATC cut from thick packaging is made using my most fave coloured Distress inks (for a long time I only had 2: Vintage Photo and Broken China and they are still the ones I love the best!). The little ticket is another all time favourite, free some years ago in my beloved Craft Stamper magazine... It's a ticket to Fairyland - I love a touch of whimsy! The flowers are from Basic Grey, I can't remember which set (owls and tree branches) I stamped and embossed lots of extra's and cut them and fastened them on with brads out to add dimension. This was embossed several times with a sprinkling of Glamour dust sprinkled lightly over it to add fairy sparkle. When I saw the Simon Says Stamp challenge today, I was absolutely thrilled, it was a recipe challenge. 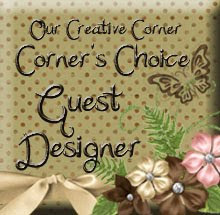 You need to create something which includes, torn edges, distressing, wings and a button - bliss! A small tag made by using a die cut large heart which was then crackle glazed using gold nail polish and white crackle glaze nail polish (!) as I had no Distress Crackle. Distress embossed with Old Paper Distress Embossing Powder. The edges were sanded down and swiped with Distress Ink in Dried Marigold. The wonderful image is from the fabulous Graphic 45 Steampunk Debutante pad which is so gorgeous I was reluctant to even cut into! To finish, I added Glossy Accents to the ladies Top Hat, some distress stickles, a beautiful Prima flower(which I distressed and added Glossy Accents to and the spare button from one of my daughters old PE teeshirt. A romantic lady dreaming of her Valentine, created on a wet and windy evening in Brighton. Though the forecast is for heavy snow, it is pouring with rain and blowing a bit of a gale outside. So, I snuggled up and created this. Coloured in Promarkers and lots of added black and silver grey glitter to highlight the details. The heart was stamped using part of a forest stamp (!) and then glossy accented and glittered. 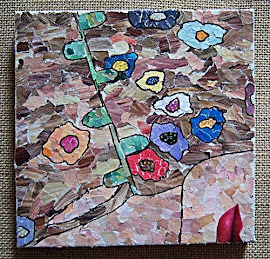 The lady came from the huge box of images that my daughter uses to create collages (her favourite art form) She has collected magazine clippings etc for the last 3 years. Even junk mail gets scoured for suitable bits 'n' bobs for collaging! 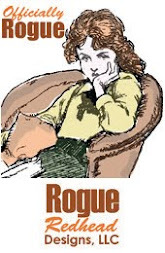 Sorry I cannot be more specific about the lovely Regency lady. 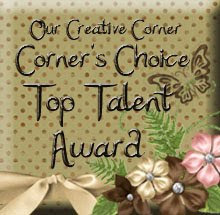 I am entering this in the Our Creative Corner Challenge. and the Delicious Doodles Challenge - all loved up!